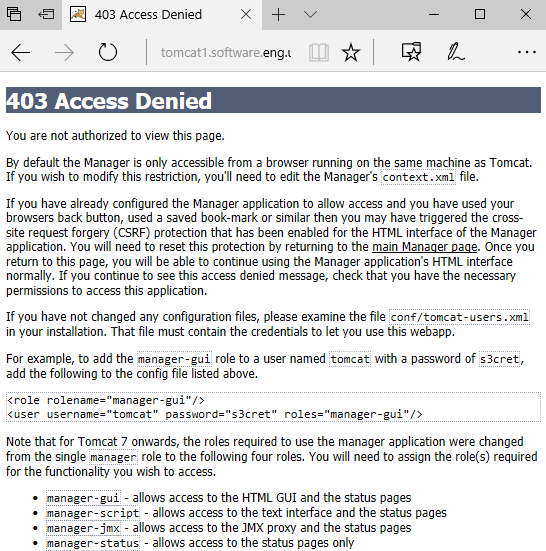 This error appears when attempting to access Server Status or Manager App or Host Manager in Tomcat. The error starts by stating that "the Manager is only accessible from a browser running on the same machine as Tomcat" and recommends to "edit the Manager's context.xml file" to resolve this. If using a version 8.5.3 or below of Tomcat, the context.xml file is located at $TOMCAT_HOME/conf/Catalina/localhost/. If using version 8.5.4 or above of Tomcat, the context.xml file is located at $CATALINA_HOME/webapps/manager/META-INF/context.xml. By default,the $CATALINA_HOME/webapps/manager/META-INF/context.xml file will have the following markup. The Valve section only allow access from 127.x.x.x or ::1. Comment out the Valve section. You should now be able to access Server Status or Manager App or Host Manager in Tomcat.